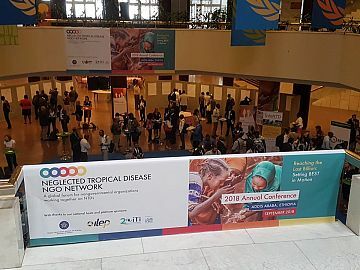 More than 500 delegates attended the 9th Neglected Tropical Disease NGO Network (NNN) annual Conference in Addis Ababa last week, for which the overarching theme was reaching ‘the last billion’ people affected by neglected tropical diseases (NTDs). Malaria Consortium hosted a key workshop, in collaboration with Ethiopia’s Federal Ministry of Health and Orbis, to provide a platform for policy makers, practitioners and researchers to discuss how primary healthcare for NTDs could be strengthened. Participants were encouraged to discuss key policy and operational issues, the prioritisation of specific NTDs, and what services can be realistically provided at the different levels of the primary healthcare system. Nebiyu Negussu, NTD Team Leader at Ethiopia’s Federal Ministry of Health, explained how Ethiopia is addressing these issues through its NTD Master Plan – for example, by integrating NTD prevention into existing primary healthcare structures. To illustrate the importance of this approach, Negussu described how close Ethiopia had come to eradicating guinea worm – only for it to keep occurring because first-contact health workers did not have the capacity to recognise and treat the disease. Malaria Consortium’s COMDIS-HSD funded study “Strengthening Primary Healthcare for NTDs in Ethiopia” involved the development of guidelines and training of primary healthcare workers on the detection, management, recording and reporting of five NTDs: trachoma, schistosomiasis, soil-transmitted helminth infection, lymphatic filariasis and podoconiosis. Orbis presented insights from its work on building sustainable primary healthcare systems for trachoma elimination in Ethiopia, including the “integrated eye care worker” model, which involves training nurses to perform trachoma surgery. Workshop participants concluded that governments should engage with practitioners and researchers to define a roadmap for integration of NTDs into primary healthcare, including the development of harmonised case definitions of NTDs and consistent guidelines and training materials. They also recommended that the evidence base needs to be strengthened and that more research should be carried out on what approaches and interventions work in different contexts.